Welcome to another edition of Mega Marathon also nick named, Bake Around The World. We, the BM group, will travel around the globe one letter each day to discover the baked goodies with that letter of the alphabet. It is A for An Pan in this space. An Pan is a traditional sweet bread with a sweet red bean paste, called Anko, from Japan. Apparently, most bakeries in Japan with the influence of France, have loads of breads but An Pan is their beloved bread. The bread/bun turned out super soft and the sweet filling reminded us of our very own Kudumulu with Chana Dal or Toor Dal and Jaggery filling. Wash and soak the beans in 2 cups of water for about 3-4 hours. Drain and pressure cook with 1 cup of water for 20 minutes or 4-5 hisses. Drain and transfer into a heated pan. Mash the beans with the back of a ladle and add sugar. Let the mixture simmer and come together as a single mass. Remove from heat and allow it to cool. Make 8 portions of the filling and set aside. Mix the flour, cornstarch, milk powder and salt and set aside. In warm milk, add sugar and yeast. Mix well and let the yeast get activated. I used a stand mixer to knead the dough so I transferred the yeast solution into a stand mixer bowl and gradually add in the flour mixture. Knead for about 5-6 minutes on low until the dough comes together in a sticky mass. Add in butter at room temperature and knead in medium speed until the dough is smooth and elastic. Cover and set in a draft free, warm place to the dough to double in size. 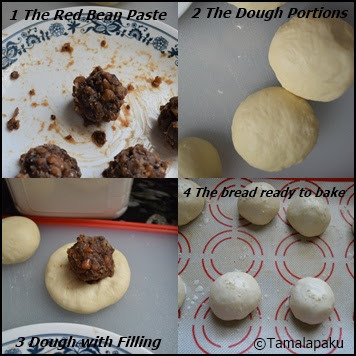 After the dough doubles in size, deflate the dough and divide into 8 equal portions. Cover and set aside the 8 portions of dough for 15-20 minutes. Flatten each portion of the dough, put in the filling, and close the edges and make a smooth round ball. Brush with the egg wash and sprinkle some sesame seeds. Cover and let them rise for another 45 min. Bake them in the middle rack for about 17 minutes. (Each oven is different so keep an eye on the buns after 15 minutes). Remove onto a cooling rack and serve them warm with a brush of butter. The buns looks marvelous Harini and now I am even more tempted to bake them. I love the sweet bean filling inside the buns. Looking forward to your rest of the bakes! Red bean filling, that's something I haven't tried yet though I know red bean paste is used in so many recipes world over. The buns look perfectly shaped and look great. Loving this sweet stuffed bread!! It is always a fun baking these stuffs for family!! I wasn't planning to make these too for the first day -- I even made the filling. But had to change plans at the last minute. Your an pan look great. Looking forward to your creations this month. Superb bake to start this Mega marathon with! I am sure kids will love this type of bun, esp coz of the sweet filling. On my visits to Japan I have always wanted to try their so called specials..but almost everything has eggs, all the same the mochi doesn't have eggs and have tried the one with red bean paste. Truthfully one need to develop the taste. Guess the bread would be different, and now that you have tried I am sure most of us will..as it definitely looks awesome. So yum Harini.. I am adding it to my todo list too. Great recipe to start with. Aan Pan would have been on top if everyone would have made it. Yours looks so wonderful and must have tasted yummy. Bookmarked to Try soon. An Pan looks absolutely fantastic and can guess the flavor of this bread. This An pan is in my to do list too. Now am tempted to give a try soon. You nailed them prefectly Harini. heard a lot about this An pan today. Finally you have successfully executed it. Good choice for starting the marathon.